In my previous blog post I told you that I had made a new discovery about the events surrounding the death of C. J. DRAKE. If you'd like to catch up on C. J. 's story you'll have to look at a couple of different posts since his story is intertwined with my great grandma Edith's story. You can find out about C. J. here and here. 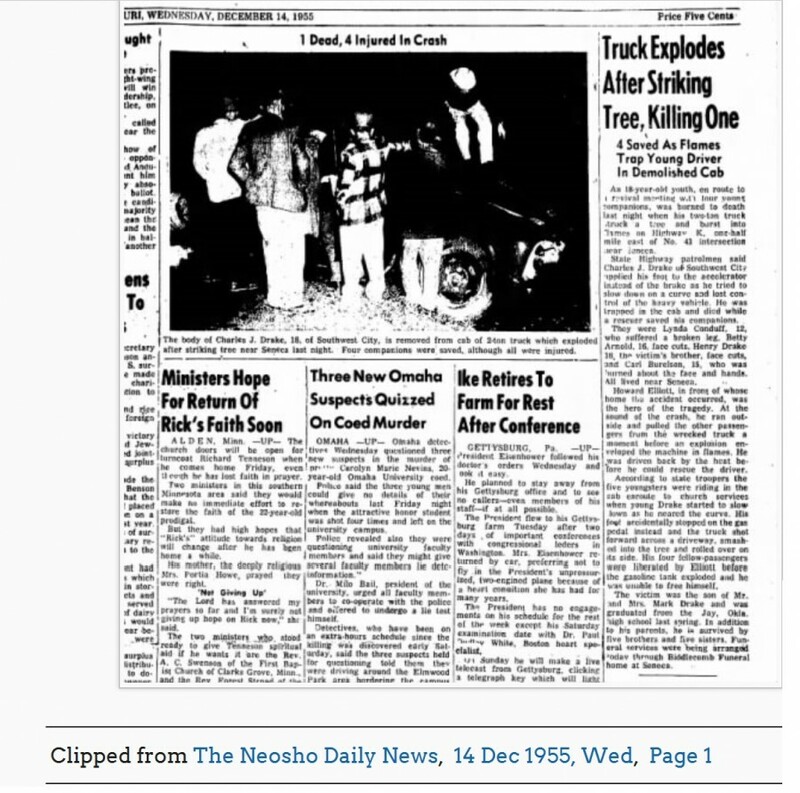 For reference, here is one of the original articles about the accident. I was so shocked and saddened (and somewhat offended) that someone would have sued my great grandparents (who were grieving the loss of their son) over a car wreck that seemed to have been just a freak accident. If you recall, C. J. and the others riding with him were headed to a revival. They weren't partying or drinking or participating in risky behavior. They didn't seem to be making poor decisions. I was intrigued about the lawsuit and wanted to know more. I called my Dad and asked him if he knew Mark had been sued over the crash (because at that time I was trying to interpret the mixed up information in the article and was going on the assumption that it was Mark who was the primary Defendant). Dad was as shocked as I was. He said he always thought there were only four people in the vehicle- C. J. and Henry DRAKE (I'm pretty sure they were cousins- not brothers as stated in one of the newspaper articles) and their girlfriends, Lynda CONDUFF and Betty ARNOLD. 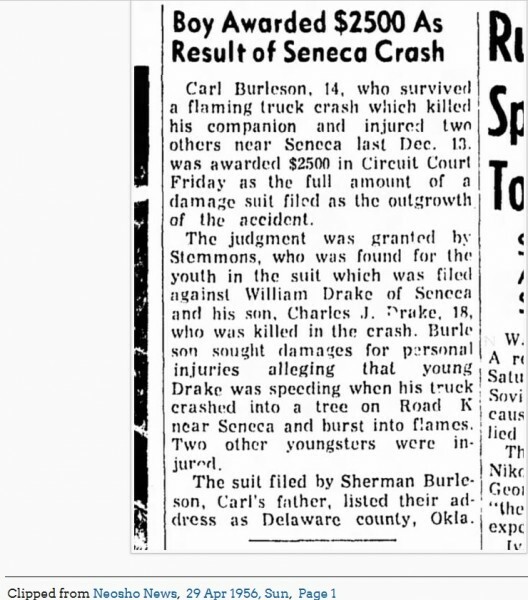 Dad had never heard before that there was a fifth person (Carl BURLESON) in the vehicle and didn't remember any BURLESON's being connected to the DRAKE family. So we talked for a while and he said he had never heard anything about Mark being sued over the crash and couldn't help me. I asked about older family members who might have known about all this but he didn't think there would be any who could help me. Our ties to the Bill DRAKE line of the family ceased to exist a couple generations back. I did try to contact someone in that branch of the family via Facebook but have not received a response. So, we decided a trip to the courthouse would be necessary to sort this all out. This week I was able to go with my parents to the Newton County courthouse and get a copy of the docket entries which are all that is left of the case. So let me walk you through what I know of Case #13218, Carl Burleson, b/n/f vs. William J. Drake, et al. (The "b/n/f" stands for "best next friend"- a legal term for the adult male representing the plaintiff- Carl's dad, Sherman BURLESON, in this case; "best next friend" was a legal requirement for minors and women in that era.) Before starting, let me tell you that I don't know to whom the "et al" refers. Et al is a legal term indicating there were other people being sued along with William. I suspect that Mark was included and he was indeed having to deal with this lawsuit while also grieving the death of his son. The William DRAKE (whom everyone called "Bill") named as the primary Defendant in this lawsuit was the son of Henry Arthur "Ned" DRAKE. (Ned played a part in another blog post story of mine about Ned's and Poppy's brother, Red.) 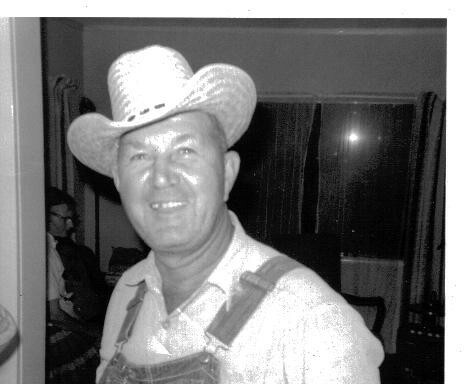 Bill was also the nephew of my 2nd great grandfather, Poppy Lonzo (Alonzo Ervin DRAKE) and the cousin of my great grandfather Mark DRAKE (the father of C. J.). You might be wondering how Bill got involved. (I know I was!) It turns out that C. J. was driving Bill's truck when C. J. crashed and died. 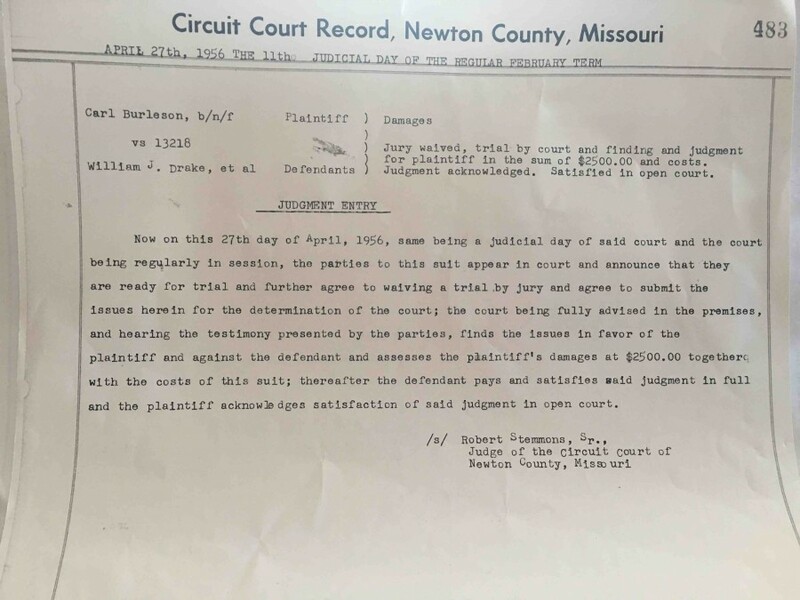 Case #13218 was filed in Newton County, Missouri in the Circuit Court on 27 April, 1956- 4 months and 2 weeks after the accident in which Carl BURLESON was burned on his face and hands, Lynda sustained a broken leg, Betty and Henry received cuts on their faces, and C. J. died. It appears that everything was worked out very quickly because on the same date the Complaint was filed by the BURLESON's, the case was also settled and a Judgment Entry made by Circuit Court Judge Robert Stemmons, Sr. The DRAKE family waived a jury and a trial on 27 April 1956 and the Judge entered a judgment in favor of the Plaintiffs (BURLESON's) in the sum of $2500 plus court costs. For my family in that time frame, that was a ton of money. However they did it, it appears they had the money ready on that date and gave it to the BURLESON's in court because the docket entry header states, "Judgment acknowledged. Satisfied in open court." The docket entry also states further down that "...the plaintiff acknowledges satisfaction of said judgment in open court." This lawsuit was never mentioned in the presence of my father. But then, my DRAKE family was pretty tight-lipped about personal matters. In doing some additional research on the key players in this lawsuit, I found a little more that I want to share with you- like this photo of Sherman BURLESON. Some of you reading this may have known him. 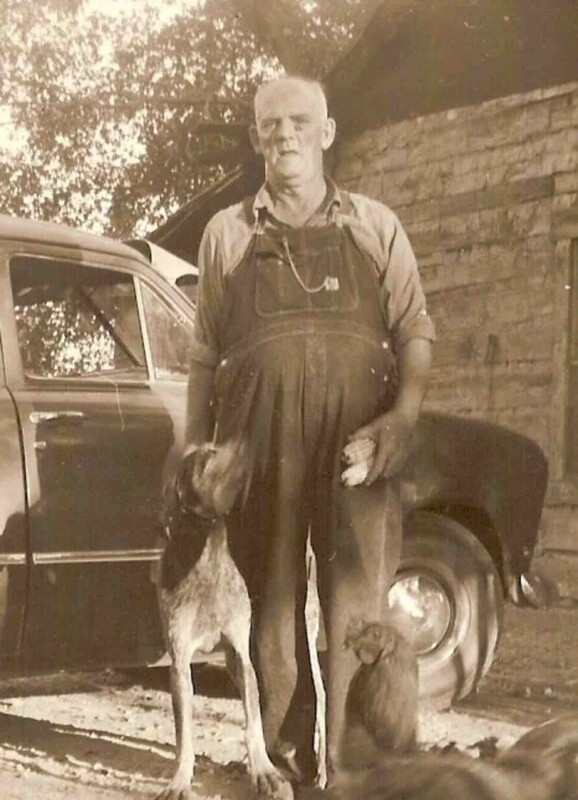 I also found a photo of Bill's dad, Ned. Ned is my 3rd great uncle. I haven't found a photo of Carl. I've read documents and family accounts of the BURLESON family that show that several members of the BURLESON family died in car accidents in the years following this lawsuit. I also learned of one other DRAKE-BURLESON connection. Bill DRAKE had a brother named Edward Ervin DRAKE- he went by Eddie. Eddie married Carl BURLESON's sister, Edna "Ginger" BURLESON. They later divorced. I'm not sure Eddie and Ginger had any children together. All of this extra information made me wonder if this series of events- the car wreck in the borrowed truck, the subsequent lawsuit, and then Eddie marrying into the family who sued my family- is what caused the rift amongst the DRAKE family between Ned's branch and Poppy Lonzo's branch. Maybe not. It just makes me wonder. How much can two brothers take before they part ways? (Both Ned and Poppy, as well as Bill and Eddie.) How long before their kids- the cousins- stop talking to each other? Before their grandkids know of each other but don't know each other...before their great grandkids- like me- don't even know if the other branch still exists? How long does it take for a family to disintegrate? How much can a family take before they call it quits? Just some things I wonder about. I'm probably being way too dramatic about it, but these are the things I think about. If you're reading this and you have more information about the wreck, the lawsuit, the family's split, or anything else about the family- I'd love to hear about it. Like my ancestors, I DO know how to be tight-lipped. If someone tells me something and asks that I NOT post it to the blog or social media- I honor that 100%. I wish your family peace this week. I wish you strong family relationships that weather the troubled spots. I wish you siblings that speak to each other and cousins that love AND KNOW each other. Tell the people you love how important they are to you. Time is so short and tomorrow is not guaranteed. I'm sure C. J. had plans for December 14th and other days and weeks beyond the day he died. You never know. Live AND LOVE like it's your last day. I thought I had commented before, but I can't find it. I've ALWAYS been SO intrigued by the Drake family history. So many stories and interesting characters and such a LARGE family. I'm the great great granddaughter of Ned Drake (Henry Arthur). I found your blog one late night as I was scouring the internet for names. I love reading your stories! Just wanted to stop in and comment on how small the world is! Also: If you ever get stuck somewhere, my great grandma Dorothy (one of Ned's 16 children) is a gold mine of information on family history. I think she actually has a book on the history of the Drakes. She's getting on in years, but I'd love to ask her any questions you might have.